Note the holes where it was pinned on! Most of the people in these images are unidentified, by the way, so if you know someone please chime in. I’m pretty sure he still has that jacket. Bonus: This little placard completes our collection of Masterson pins, begun a couple of years ago with the glorious find of Alan Grob’s lapel button, as described here. 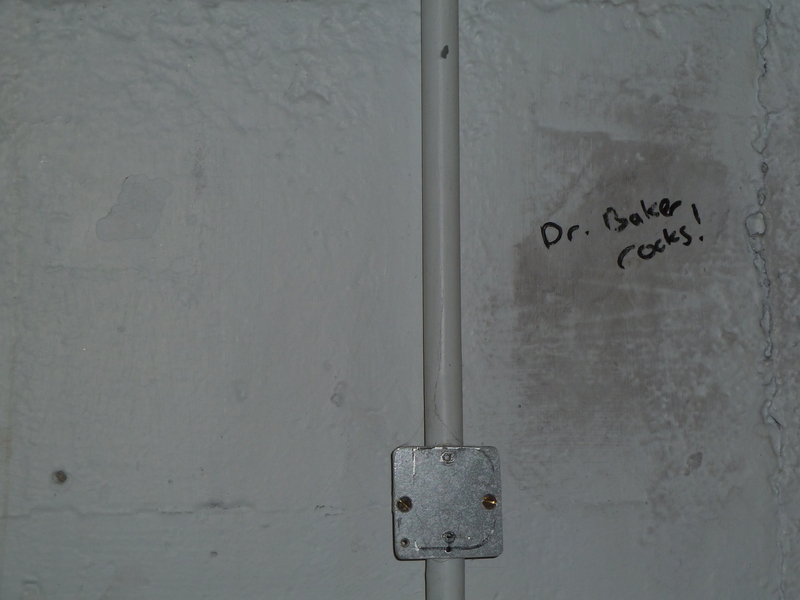 Extra Bonus: As some undergraduate astutely noted on a wall in the basement of the Physics Building, Dr. Baker rocks. Unless I’m mistaken, Doyle Arnold, a current Alumni Trustee, was a part of the demonstrations, and he might be in one of the photos? 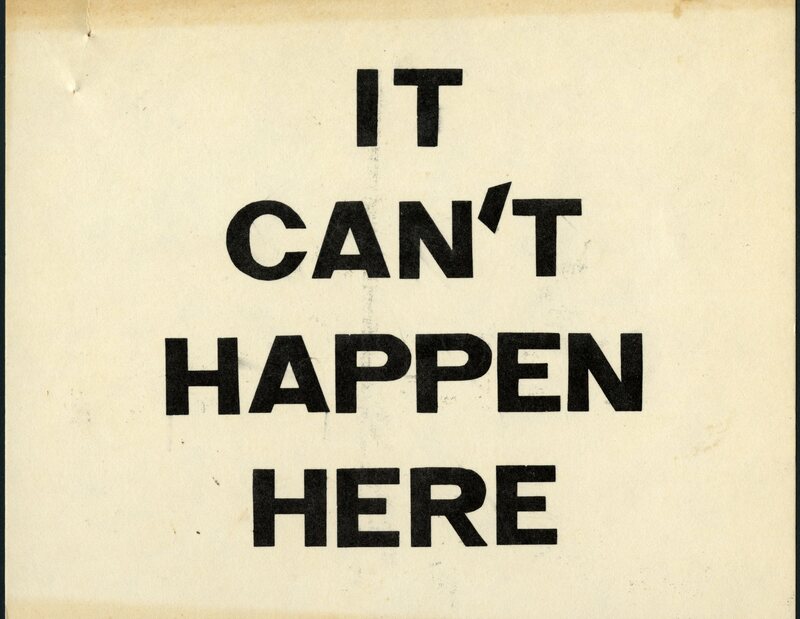 Didn’t know him then, so can’t be sure…. I remember distinctly how the student leadership asked everyone to dress nicely, suits, skirts, etc. Of course, a few people showed up looking like they rode in on a garbage truck. And of course, they’re the ones who the TV stations and newspapers filmed. All in all, it was a quite civil event. DeBremaker was a major trouble maker. 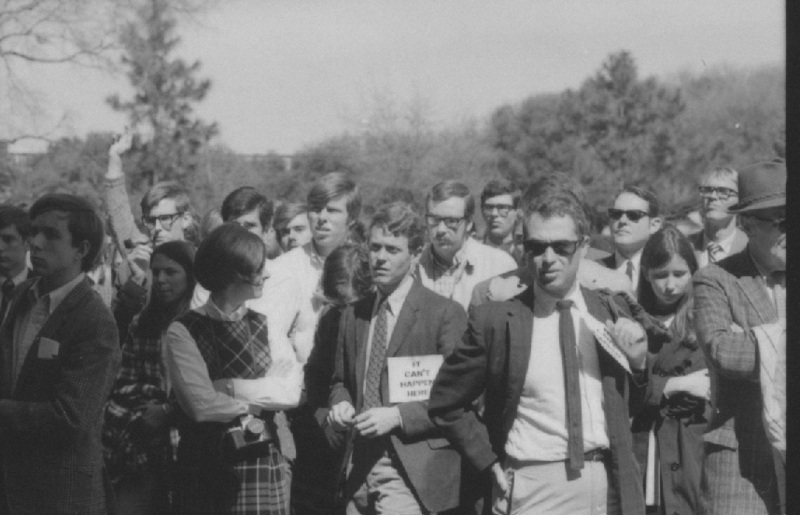 In the photograph above Dr Gruber, in which someone in the back left has raised his hand, the front and center student with It Can’t Happen Here pinned on his jacket, standing next to the woman in a plaid jumper, is Ron Bozman, Vice President of the Student Association, who worked closely with Warren Skarren on the responses to the Masterson appointment. Ron has had a distinguished career in the movies as a producer. He began his film work at Rice, working with Bill Colville in the pr office, took me to the set of Texas Chainsaw Massacre near Columbus, and went on to many more family-friendly movies. On the far right of that same picture with her head bowed, is my dear friend Paula Price, from Corpus Christi. 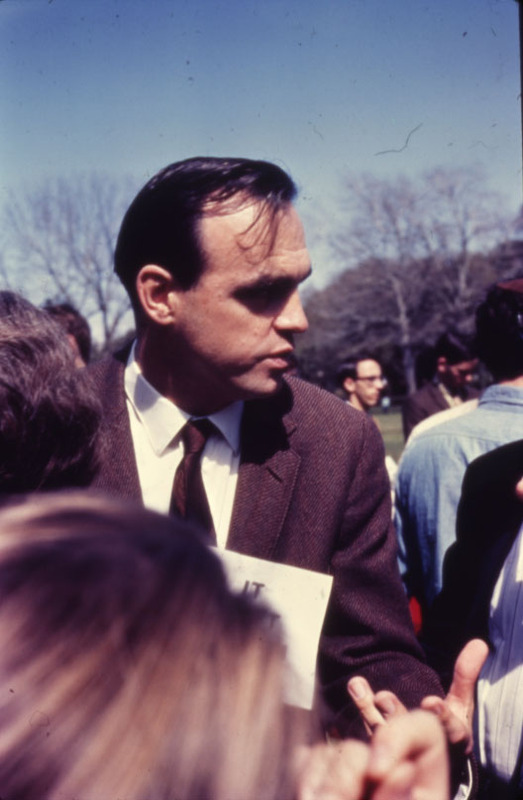 In the photograph that includes DeBremaker (thank god for troublemakers) who i always remember riding his bicycle to and from campus, to his left is Don Johnstone, of Wiess College, deceased, and next to him is John Birrotti (my spelling is uncertain), who was a presence at the Rice Media Center. 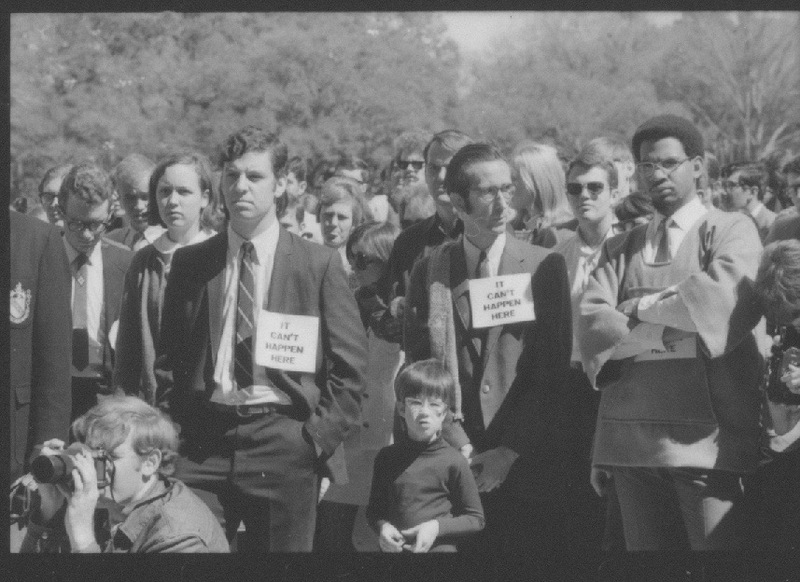 That might be me in the lower left with my old Pentax Spotmatic camera. And i take issue with the characterization of our clothes. They were from the Salvation Army, not garbage trucks. Thanks, Melissa, for all your digging in the dumpsters!